British artist Ian Miller (1946) is best known for his gothic and macabre style. Combine that with meticulous pen and ink technique, you have a visually striking image with details that hold your attention, inviting you to pore over each area of the artwork. This book contains artworks from his career of over 40 years. He has illustrated for magazines, books, and also created concept art such as for Warhammer 40,000. You'll see both his commissioned works as well as personal pieces. There aren't any chapters but the artworks featured are grouped by subject matter. You'll see dragons, ghoulish warriors and soldiers, fantasy creatures, mechanical contraptions, castles and landscapes, and other nightmarish subjects from his imagination. You'll notice that he's inspired by fishes, robots, and mechanical things. 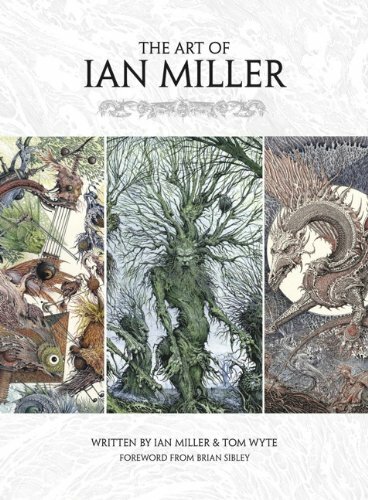 Ian Miller presents his own twist to those subjects and they often look surreal. He also has commentary for selected pieces of work. One highlight of the book besides the subject matter is the pen and ink technique used. The illustrations when you look closer are created with lines carefully hatched. The form, light and shadows are all created by the amazing line art. Each illustration must have taken an insane amount of time to finish. Many are full page artworks in this book.